Part One dealt with powder coating cast bullets using the “shake and bake” method and employing a vibrating case cleaner for application of the powder. It worked, but it was time consuming and, perhaps overly complex. The next logical step was spraying the powder, more or less in the manner in which it was intended to be used. The first and third questions were at least partially answered. 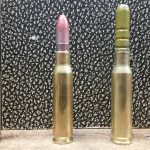 Cast bullets can, indeed, be shot at full velocity, and there seems to be no upper barrier, at least within the pressure limits of the .308 Winchester or .30-06 Springfield. Hunting accuracy was—at least initially—easily obtained. (“Hunting accuracy” was defined as ten shots in 2.5 inches at 100 yards or better—repeatedly). Questions two, four and five remained unanswered. Spraying the powder required a spray gun (duh), a compressor (ditto), a pressure regulator and moisture filter. Many compressors come with a built in regulator and include a filter. Mine did. If yours didn’t, these items will be an additional cost. The spray gun came from Eastwood Auto Restoration (www.eastwood.com), and cost less than $100.00. There are other sources. These are not garden variety paint sprayers. They plug into an electrical outlet and have a lead that is clipped to the part to be coated. Its purpose is to impart an electrical charge to the object to be coated to aid in powder adherence. Add paint, read the directions and you’re ready to go. Also VERY important, is a respirator. There will be a lot of dust in the air. A fan to move the dust towards the garage door is also helpful. To be considered is hearing protection if your compressor is in the same room. Muffs were essential in my case. First, read the directions. This is important. Do it. There are some risks here. Place the bullets nose up on the oven tray. 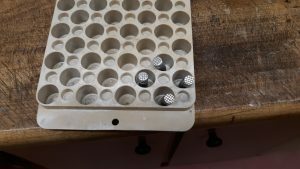 (Placing the bullets on a piece of window screen solves the problem of the bullets sticking to the tray, but induces some balance issues when moving the tray to the oven. The thicker screen used as a concrete reinforcing or a fine hardware cloth would probably be even better, if a small piece can be obtained.) Add powder to the reservoir, plug in air and electricity, clip electrical lead to the (metal) oven tray, dial your outlet pressure down to 5 pounds. Really. Five pounds. (It may be necessary to fiddle this up or down a bit.) Spray until all bullets are lightly and evenly coated, then handle and bake as previously described. One would not think that powder would get under bullets sprayed this way. One would be wrong. They still stick hard enough to remove most of the gas checks if placed directly on the tray. It seems that applying these is a step best left for last in that case. If a screen is used, they may be gas checked prior to coating. The screen leaves a unique and interesting pattern on the gas checks. The attachment of the electrical lead can also be skipped. There was no difference in doing it and not doing it. Lead IS conductive, but, where copper is rated at 100, lead is rated at 7 (or some single digit number), so it’s not very conductive, and apparently not enough conductive to matter in this application. Clipping the lead to your tray guarantees a very attractive oven tray. The upside of this method is that it results in a very nice even, thin coat. It adds almost nothing—maybe 0.001”- to diameter. The down side is that it seems to be very wasteful (remember, I’m cheap). A LOT of powder comes out the end of the gun to put very little on the bullets (spray and pray?). 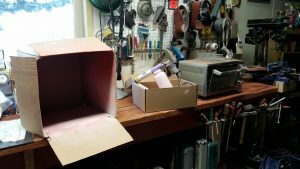 Much of it ends up on the floor, bench top and in the box used as a spray chamber. Spraying is a viable method, and produces a very nice looking bullet. Results on target were not any better than the vibratory cleaner assisted shake and bake described in part 1. Bullets produced by the latter method were a bit on the ugly side. The clear coat appeared blotchy with dark patches covering about half the bullet. It was determined that this resulted from impact with the black air soft shot. Both methods had negatives, so it seemed like more experimenting would be appropriate. Back to shake and bake. Several different buffers were tried, including shot shell buffer. Don’t try that one. What a mess. The last method is quick, inexpensive and effective. It works perfectly for me. Will it for you? It’s probably a good place to start. If more complex methods are needed, well, “see above”. Have any additional questions been answered? Yes. The best method for me is the last—shake and bake with no tumbler and no buffer. No difference in results on the target can be detected between any of these methods, so the simplest method seems best. After all this, what about results and actual targets? Next month, I’ll post some targets and talk about velocities. Having hit the limit with the .308, some initial work with the .223 has been undertaken. Weather permitting, I’ll be able to fire some of these into newspaper to see how they hold up at these speeds. Some additional questions have arisen. Those will be addressed as time permits.